Any discussion of the great masters of American English must include the writings of Mary Frances Kennedy Fisher. For more than sixty years, in her writings about family, food, and travel, Fisher amassed a body of work that belongs on any shelf of classic American writing. Assembled here in this new edition is a generous selection from the books written throughout her career, arranged chronologically, offering readers a magnificent, intimate survey of her life and writing. 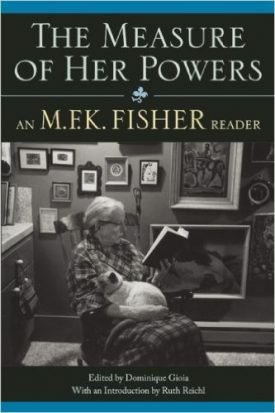 Whether reflecting on her father’s affinity for the underdog or bravely navigating the trials of old age, Fisher’s candor and wit are vigorous and infectious. Tales of travel, childhood memories, recipes massacred and perfected, meditations on World War II, and thoughts on cataract surgery—the range of stories on her palette is surprising and original. The Measure of Her Powers, finely edited by Dominique Gioia and introduced by Ruth Reichl, will captivate those who have never read Fisher and deepen the appreciation of her many fans. M.F.K. FISHER is widely acknowledged as the creator of the genre we now call “food writing.” She was elected to the American Academy of Arts and Letters and received lifetime achievement awards from the James Beard Foundation and the American Institute of Wine and Food. She died in 1992. DOMINIQUE GIOIA (editor) is a journalist and the editor of A Welcoming Life: The M.F.K. Fisher Scrapbook. RUTH REICHL (introduction) is the editor in chief at Gourmet magazine. Previously, she was a restaurant critic for the New York Times and the Los Angeles Times, and she is the author of several books, including Tender at the Bone and Not Becoming My Mother. She has received numerous awards, including four James Beard awards.